Salads are usually the stars of summer dining tables. That´s no surprise. There are thousands of recipes for these fresh dishes and it is almost impossible to tire them given their endless variety. 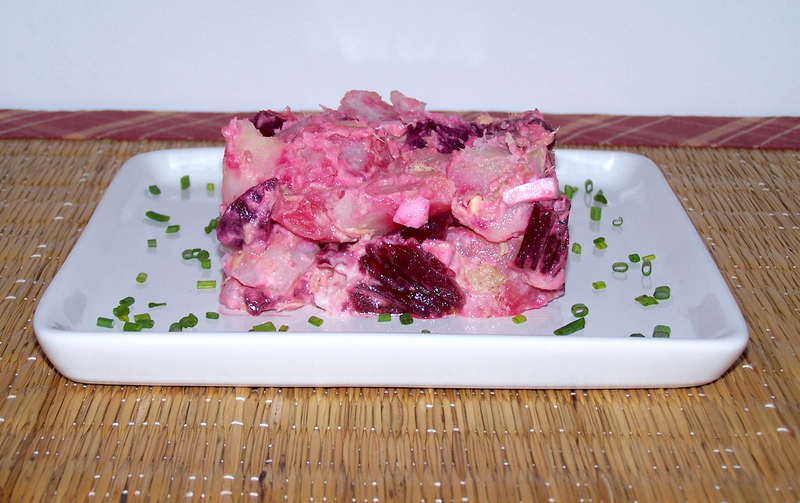 For example, this beetroot salad with white tuna in pickled sauce has been sent in by La Cocina de Manel y Pilar. Although some ingredients are reminiscent of Russian salad, beetroot adds a very personal touch. Boil the eggs for 20 minutes. Meanwhile, peel the potatoes, cut them into squares, and boil them in salted water for 15-20 minutes. Chop the onion and beetroot into small pieces. Once chopped, put in a bowl and add the tuna. Once the eggs are cooked, peel and cut into small pieces. Add them to the bowl. Once the potatoes are cooked, drain and cool under the tap. Once cold, add them to the bowl with the rest of the ingredients. Season with Extra Virgin Olive Oil and salt, stirring to blend the flavours. A different take on salad. Thanks, Pilar!